While I love fall, I have a strong dislike of holiday decorating. The worst part is that I have a closet full of decorations that I put up every year like clock work when my oldest was little. Then I had my second son and things got a little less fun. Now I am lucky if I get the table top tree up for Christmas. I always make big holiday meals and my table looks great, but decorations annoy me. I think they look great in other people's houses. In mine they spell dust, sifting through closets, and generally too much effort. I don't mind the putting up as much as the taking down. One of the funniest memories I have growing up was my dad wrapping yards and yards of christmas lights around a wrapping paper tube to put away. After the 10th one he just threw the rest away and decided to get new ones the year. My mom got mad and decided that we wouldn't decorate the next year. Instead of being upset, my dad and I remember it as the best Christmas ever since we were always the ones that had to do all the decorating and putting away. Luckily my kids are happy with lots of food and just one decorated table top tree. I am happy that it literally takes seconds to put everything away after the holidays. So at Halloween my house won't be the one with the decorated pumpkins, ghosts, and witches. It will still be full of laughter, fun, and food just with a little less decorating than the other houses. I try to make everything I can from scratch, including almost all breads and baked goods. 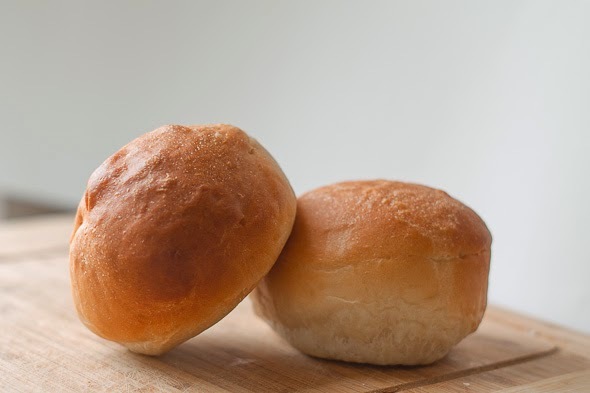 For years I tried to find the perfect hamburger bun recipe with mixed results. I found one that was quick, but the shape and texture just weren't perfect. Then about a year ago I tried a new recipe and loved it. It was perfect and I have been using it ever since. Here is the recipe, it makes the perfect buns! Adapted from the Food Network. Heat the milk and 3 tablespoons butter on the stove, just until the butter melts. Pour the mixture into a bowl and add the 1/2 cup warm water and the remaining 3 tablespoons butter. Add the salt, sugar, egg, and egg yolk. Dissolve the yeast in the 1/4 cup warm water. Wait until it foams (about 5 minutes) and then add to the bowl. Add flour until the dough comes together. You may not need the full 5 cups. Turn dough onto the counter and knead for 5-8 minutes. Adding more flour (or warm water) as needed (you want a soft, but not sticky dough). Place dough into an oiled bowl, cover with plastic wrap and allow to rise for 2 hours (or until double in size). Punch down dough, re-cover bowl and allow dough to rise for another hour. Punch dough down once more. Make dough into 10 pieces. 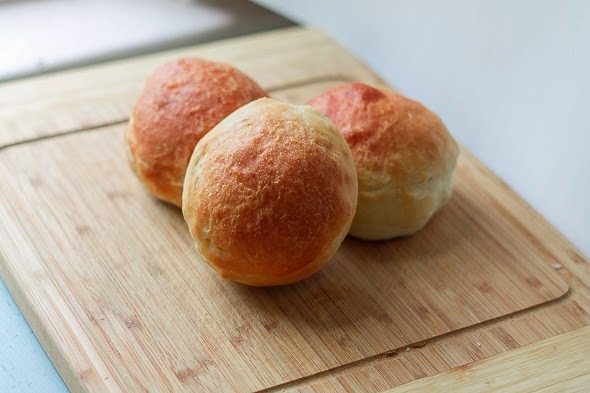 Roll each piece of dough into a smooth ball. Cut each ball through the center (like you would if you were cutting a bun to place a hamburger within) into two pieces. Place the two pieces back together (the same way they were before you cut them) and pinch the seam close. Tuck the pinched seam under the ball. Place the finished bun on a parchment lined baking sheet and slightly flatten the bottom. Repeat with the rest of the dough. You should end up with 10-12 total buns. Cover and allow the buns to rise for 30 minutes. After rising brush the tops of each bun with melted butter. Brush the buns once more with butter. This recipe may seem daunting at first with all the steps, but it really isn't. Once you have made it once it is very easy and it takes me less than a 1/2 hour of actual work. If you have a bread maker the steps up until the second rise work great in a bread maker. I normally use my bread maker on the dough cycle to prep bread, it's so much easier. If you have instant or bread maker yeast, you can skip the step of proofing the yeast in water. I just combine my yeast with the flour and then add it to the wet ingredients. I only proof my yeast about once a month to make sure it's still active. 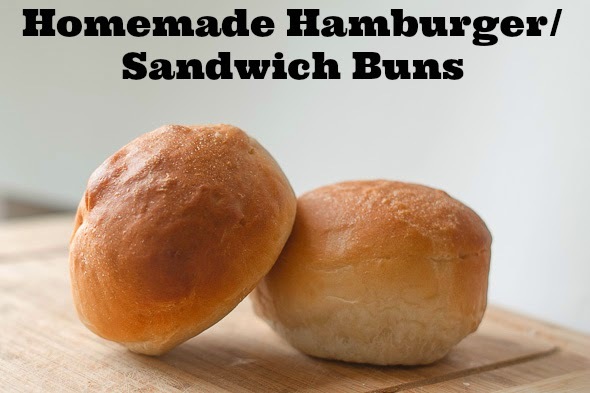 These also make great sandwich buns, so don't just limit yourself to burgers! These burger buns have turned out PERFECT, Ann. Thanks :) They really are a great bun, either for sandwiches or burgers. I have tried so many recipes that just don't turn out, but this one is a keeper! I used to decorate A LOT before kids and now that I have 2 of them, I totally can't be bothered. I used to love decorating and the last time I decorated was when my toddler was born in 2012. Haven't done anything since then. I usually end up doing it all myself instead of getting help from my kids. Now I've never had my own hamburger buns before, I usually just buy them but I would love to make these. I'm sure they taste so much better. Buns from scratch are really good and you can freeze them for later use if you don't use the whole batch at once. Just cut them first and wrap each one with parchment or butchers paper and stick in a freezer bag. You know what, I also settled for one christmas tree for the holiday season and I found that it didnt dampen the yuletide spirit. Despite the lack of decorations, I love christmas! Baking breads gets easier the more that you do it. The first 10 times I made bread they were pretty much disasters, but now I don't even really have to think about it. It just takes practice. These burger buns look perfect. I am definetly going to try this recipe. Thanks :) If you end up trying it, tell me how it turns out!